Why Josh Hamilton? I've been following Josh's career since he was a prospect in the Devil Rays organization. 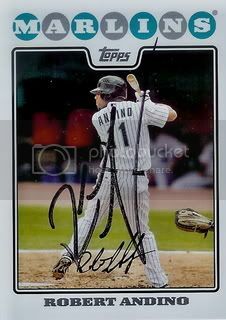 I met him when he was in the Arizona Fall League in 2001. I followed his ups and downs over the next few years. I even remember watching his MLB debut on Opening Day 2007 ( Thank you MLB Extra Innings ). 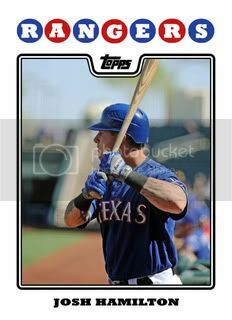 I'm hoping Josh bounces back from last season's injuries and has an MVP-type season as he leads the Rangers to the top of the AL West in 2010. If you haven't figured it out yet from previous posts, I'm really excited about the Rangers next year. On a side note, I've decided that Sundays will be custom card days for the foreseeable future. Got a nice package in the mail from blog reader Dan. It included two signed 08 Topps cards. The second card was of for Noah Lowry. Noah's career has been plagued by injuries. He hasn't pitched in the big leagues since 2007. The Giants released him back in October and it is unclear if he will ever play again. Thanks for the great cards, blog reader Dan! I'll try to have a thank you package sent out shortly. The first is of long-time Los Angeles Angels star, John Lackey. You may remember John from the 2007 All-Star game or the 2002 World Series. In 2010 he'll be putting on a Red Sox jersey and trying to add to his 102 career wins. Thanks for the great card, blog reader Dan! Ryan from The Great Orioles Autograph Project sent me a signed card of current Orioles infielder, Robert Andino. If you've never seen Ryan's blog, you should definitely take a few minutes to check it out. He cleaned up at the Orioles Fan Fest this past weekend and added a bunch of new Orioles card to his collection. Thanks for this great card, Ryan! Why Grant Desme? 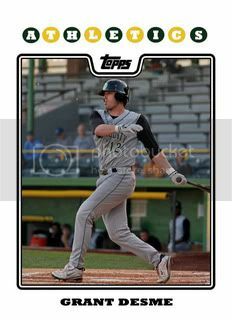 The 2009 Arizona Fall League MVP was in the news over the weekend for his decision to retire and enroll in seminary school. Pretty cool. We wish Grant all the best in his post-baseball life. 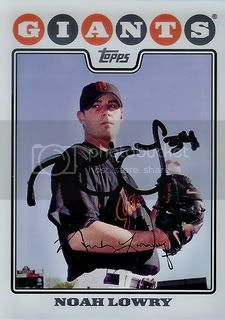 Hopefully one day he'll sign TTM and we can send him our custom card and ask for an autograph. Our first custom card debuted yesterday and I've been having so much fun making these I'll be sharing a few more over the next few days. 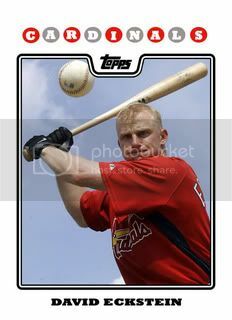 Next up is 2006 World Series MVP, David Eckstein. It seems like everyone is making their own custom cards so it's officially my turn. I'd like to come up with some original designs sometime but I'm starting off with my own 2008 Topps cards. For the sake of organization, I'll go ahead and number these to help me keep track of how many I've made and posted. Of course I will have to print a few of these out so I can see what they look like autographed. You can count on a few follow up posts in the upcoming months. 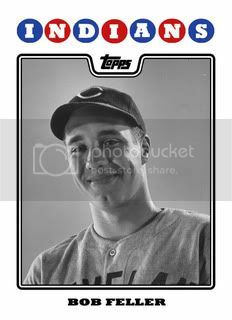 Starting off with a Hall of Famer and baseball legend, Bob Feller. 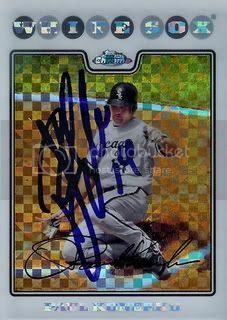 After getting Paul Konerko to sign his regular issue 08 Topps card in December, I remembered that I had bought his Xfractor from the Chrome set. Needless to say this one was quickly sent out in a TTM request and came back signed today. Not only is this the first Xfractor we've gotten signed, it is also the first signed 08 Topps Chrome card of any kind in our collection. I've always liked Xfractors and Refractors so hopefully we can add a few more of these to go along with our base set. 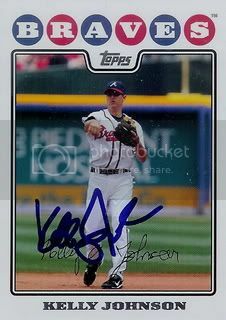 A friend over at SportsGraphing.com helped me out with six signed 08 Topps cards. 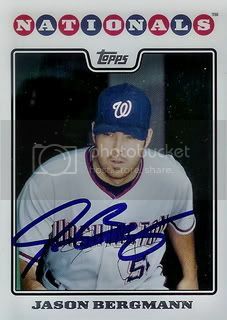 The sixth and final card is of Washington Nationals pitcher, Jason Bergmann. The former Rutgers University star will be fighting this Spring to hold down a spot in an improved Nationals rotation. 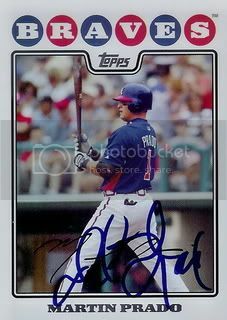 The fifth card we received is of Atlanta Braves second baseman, Martin Prado. Martin has been up and down between the minor leagues and the Braves since 2006. He will be looking to earn the job vacated by Kelly Johnson this spring. 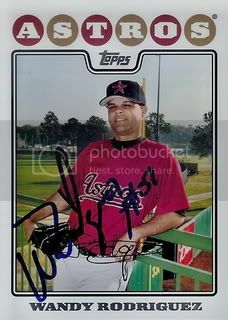 The fourth card we received is of Houston Astros pitcher, Wandy Rodriguez. Wandy put together a nice season last year. He finished in the top ten in strikeouts and ERA for National League pitchers. The third card I received is of former Houston Astros outfielder, Josh Anderson. Josh spent time last year with the Detroit Tigers and Kansas City Royals. He is currently getting ready for his first Opening Day in a Cincinnati Reds uniform. 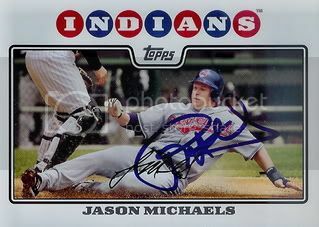 The second card is of former Cleveland Indians outfielder, Jason Michaels. Jason is getting ready to head into Spring Training as a member of the Houston Astros. He's always been a solid part-time outfield and will probably fill the same role in Houston. The first is of the new Diamondbacks second baseman, Kelly Johnson. Kelly's put up some good numbers the past few seasons and should do a great job in the D-Backs infield. I was going through a box of cards we got signed sometime in 2008 and found this Mark Reynolds card. If I remember correctly, we had sent Mark a TTM request around the beginning of the season and he sent this card back signed. This was before my son was born and before I even had the idea of trying to get this set signed. I recently picked up the Boston Red Sox 55 card Gift Set which included a card of Fenway Park. 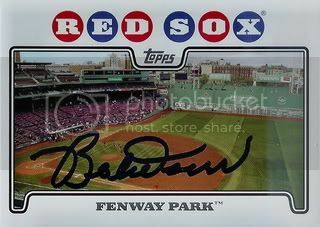 Right away I knew that I would be sending it to Sox legend and Hall of Famer, Bobby Doerr. This stadium card will go great with the Red Sox Celebration card he signed for us last April. Bobby has always been a great TTM signer and I definitely appreciate him signing this card for our collection. 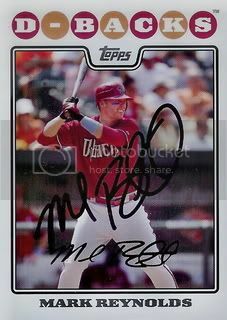 By popular demand I now have a checklist online where you can view which 2008 Topps cards we have signed and which ones we still need. I've uploaded the spreadsheet I've been using to Google Docs and it is now viewable to everyone. I'll probably update this every month or so. I've added a link to this over in the right hand column too under the "Contact Me" section. If anyone has any problems viewing it or have any suggestions, please let me know. Thanks! The first was at the 'ol P.O. Box this morning. 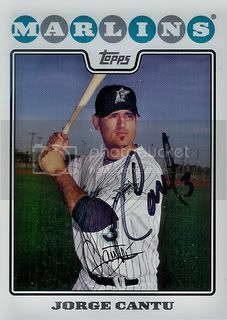 Brian from 30-Year Old Cardboard sent us a signed 08 Topps card of Florida Marlins star, Jorge Cantu. I know I've said this before but I'll say it again, Brian runs one of my favorite blogs. The second of the day came just a few minutes ago. One of my and Brian's favorite players, Andre Dawson has been elected to the Hall of Fame. If you haven't already, go check out 30-Year Old Cardboard and read Brian's Andre Dawson Hall of Fame post. Might as well leave a comment while your there too. A local Wal-Mart that is just far enough away that I rarely visit had their 2008 Topps 14 card team sets on sale for 60% off. They only had the Yankees and Red Sox so I grabbed one of each. These aren't anything too special. One or two cards in each have a different picture than the regular Topps issue. These are my fourth and fifth team sets like this. I previously had purchased the Cubs, D-Backs, and Indians. 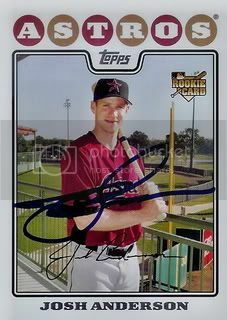 At the end of Spring Training back in March we had 43 signed 2008 Topps cards. At that time I thought to myself that it would be really cool if we could get up to 100 by the end of the year. Well, it's officially 2010 and that number was significantly surpased. With the help of fellow bloggers, 50/50s, a lot of TTM requests, etc. we were able to finish the year with 184 cards. That is just under 19% of the entire 990 card set. 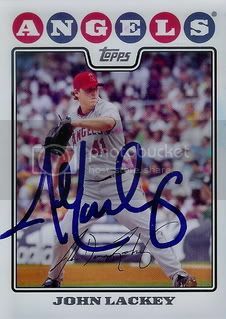 Progress: 350/990 - I think 350 signed 2008 Topps cards by the end of 2010 is a realistic goal. Alot of thought was put into this number. It depends heavily on how many TTM requests I am able to send out for Spring Training and the regular season. This might end up being a little bit of a challenge but it is attainable. 2008 Topps Opening Day - I'm not officially starting this set and probably never will but I would like to get a few of these cards signed. Since I only have one set I won't be sending many TTM. I would like to get at least 10 of the 220 cards from this set signed this year. Custom Cards - Inspired by blogs like Goose Joak and Custom Card Blog, I want to try my hand at making my own custom cards. Well... my own custom 2008 Topps cards, of course. Keep My Blog Alive - There are many demands on my time. Family, friends, work, and even autographs all have priority over blogging. This goal is pretty simple. I want to keep updating my blog. I think I've done a pretty good job of that so far. The offical post count for 2009 ended at 179. For a little over 10 months of blogging, that's not too bad. 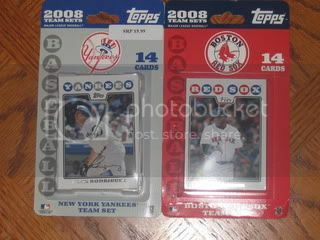 If I can keep averaging a post every other day, 2010 will be a good year for My 2008 Topps Set Blog.